You’ve spent the last few months being really consistent with your workouts. You’re seeing awesome progress in your fitness, and you feel great at the gym. I’m sure this isn’t earth-shattering news to many of you, but even with the best intentions, and even if you love working out, sometimes it’s really hard to make it happen. Whether it’s work, family, or anything else, sometimes your plate is beyond full and you’re being pulled in a million directions any given day. You’re stressed out and so exhausted that the idea of trying to cram in an intense workout is incredibly overwhelming. Obviously, the ideal scenario here would be to simplify your life, say “no” when you need to, and free up more space to take care of yourself through fitness and the like. But, sometimes that’s just not an option. Sometimes you have to put your head down and turn on “grind mode” for a while. When you’re in a chapter of your life where every day feels like a marathon, it’s easy to feel discouraged about your fitness. I definitely get it, because I’ve been in that boat for a few months now. Between my full-time job, this blog, the gym, and other miscellaneous life obligations, I have a lot on my plate. Some days I feel so wrung out that I’m virtually catatonic by the time I go to bed at night. As you can imagine, my workouts have definitely suffered. Even though I love working out, some days it’s so.freaking.hard to drag myself to the gym and slog through an intense workout. This is a big change from where I was a year ago, so I’ve been putting a lot of thought and emotional energy into trying to adapt to this new normal. I want to share some advice and encouragement if you’re feeling a little beaten down, too. Sure, when my life and my obligations were different, I could spend 1-2 hours at the gym 4-6x a week. So, naturally, it’s easy to feel guilty when I only make it to the gym 2 or 3 times. But the thing is, that was then and this is now, and it’s important to accept that sometimes, things in your life shift and you have to learn to flex and flow along with them. You don’t have to be training like a mad woman to reap the benefits of fitness. You can still stay fit in just 2 or 3 sweat sessions a week. No, it doesn’t feel good to cut back on your workouts, but balance is an important part of health, too. Stop wasting your time and energy on guilting yourself for not doing as much as you used to, and instead focus on making the most of the time and energy you do have. When workouts seem overwhelming, you can still care for your body with nutrition. Sometimes when you’re feeling stressed out and crazy-busy, it’s easy to turn to snacks and meals that aren’t so good for you. If you spend a couple of weeks committing to eating well and not worrying too much about your workouts, it can do wonders. In fact, it has two potential benefits: not only does improving your food habits help your health in general, the right food could also give you more energy to get back to the gym and make your workouts happen. If you’ve been working out in the evenings, try a morning routine for a while, or even something in the middle of the day. If you’re a working lady and you feel exhausted by the time you finish your workday (I know I do), it’s so nice to have your workout already out of the way so you can just go straight home after you clock out. In fact, whether it’s morning or evening, some people find that working out at the right time for their body actually gives them more energy for the rest of the day. It’s worth experimenting! If you’re constantly feeling exhausted, it might not be the best idea to go to a high-intensity spin class every night. Try dialing it back and spend a month or two doing something a little more gentle instead, like yoga or barre classes. You can still move your body without totally draining all the energy you have left in your tank. Yoga especially can be rejuvenating but still challenge you. Or, maybe even just taking a nice walk with a loved one is what you need for your body and your mind. This whole point goes back to the expectations thing in #1. It might be a good time to redefine what being active looks like for you in this chapter of your life.ain. Learn how to tune into your body and your mind. Know when you need to push yourself to go to the gym anyway and when you need to take time to rest. Sometimes, if you can get over that barrier of low energy and just get yourself out the door, you’ll actually feel better once your workouts starts. But that’s definitely not true all the time! Depending on your personality type, you might be tempted to just push through every single time, which can be really counterproductive if you take it too far. Sometimes, you really are pushed to your limit and you need to use that extra hour or so to care for yourself in some other way, like get to bed early and literally rest. You won’t always get it right, but it’s important to work toward learning the difference. This point is the most important of all. Low energy and stress often come hand in hand, so if you’re feeling stressed out already, the last thing you need is to get down on yourself for missing your workouts. Be kind to yourself. Remember that none of these changes have to be permanent. It’s important to take a step back and reset. Remember you can always go back to your normal routine when you’re feeling back up to speed. Thank you for saying this because I feel the same way. I’m more exhausted when I’m on that roller coaster. Great tips. And for people who work out to lose weight/fat, they should be reminded that althouigh you can work out a ton, unless you eat less and more healthfully, you won’t (or at least it will be very difficult to) lose weight/inches. On the other hand, if you eat less and more healthfully but don’t work out as much as you’d like, you will likely still lose weight/inches. Thus, most doctors will tell you that to lose weight, you absolutely must eat a little less (and more nutritiously). Yes, great point! Although working out can be valuable, it doesn’t have to be the end-all-be-all. Ugh, word. 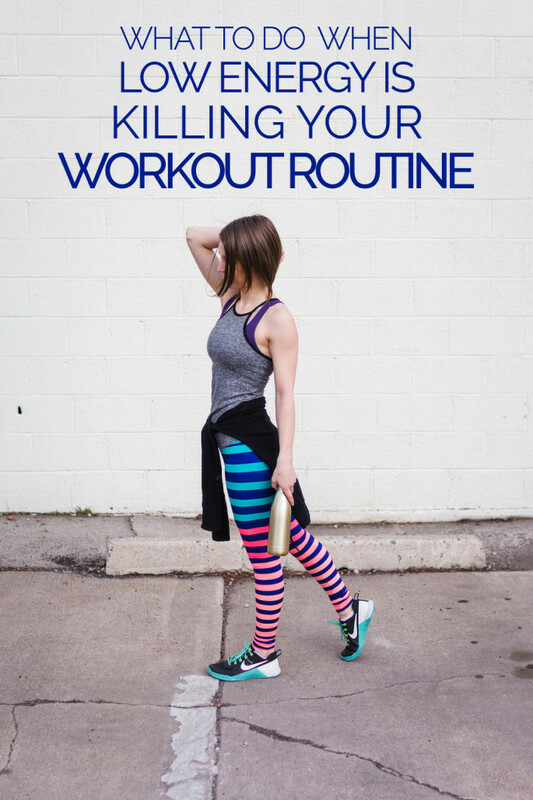 Keeping up my routine is especially hard for me because I’m naturally lazy – I didn’t start working out until a few years ago, when I finally got tired of feeling older than I should and hating how I looked in all my clothes. It’s been up and down since then… in fact, I just came out of a nearly two week long “rest period” after falling off a pretty intense fitness wagon. But at least I know I’ve turned a new leaf, and for every step back I’ve taken, I’ve made two steps forward! These are all excellent points, but 6 is my mantra! Yes, I love the 2 steps forward for every 1 step back. It can be hard when that step backward happens, but ultimately, we’re still miles ahead of where we were years ago. Maybe literally, hah. Low energy levels could be due to iron deficiency too. I exercised pretty intensively couple of months back. After a while, I noted that my overall energy level was low, and was dropping more hair than usual. A quick check with my doc and some tests revealed iron deficiency, which I never had before. Think I pushed too hard- too much exercise and insufficient nutrition due to very tight control of food intake. Now I eat more, and concentrate on getting stronger, not leaner. Yes, very true! I’m glad you were able to figure it out! After that painful period I have learnt to take things a bit easier ie do yoga /easy spin class during those days and work hard on the other days. Or If I do cross fit I would go lighter onthw weights n really focus on form instead of trying to hit a PB . I’m planning to try crossfit (I currently powerlift and have a history of gymnastics, so it just seems like fun!) in the fall post-graduation, once I feel a little less financially insecure, and I’m wondering how you handle missing sessions. My concern is that if I pay for a 2 x or 3x per week membership and can’t make a day that I’ll be losing out on money. How do you handle this sort of thing? Also, do you have for a second gym or do you only do crossfit? My closest crossfit (I believe there are approx 12 in my area) has no cardio machines at all, and I believe you have to pay extra for open powerlifting time. What’s a broke adventurous girl to do?! How exciting!! :) It was a great day when I felt like i could afford crossfit (or whatever) without feeling like I had to give up groceries, hah. My crossfit gyms have only ever offered an unlimited option. It’s definitely not cheap, but then there’s no set number of workouts I feel pressured to do. It’s the only gym I have a membership to, though. I definitely get my fill of both lifting and cardio just from the normal wods, so I’ve never felt the need to go anywhere else. Although I occasionally will go for the occasional run outside (and hikes, of course), my crossfit gym is pretty much my one-stop fitness shop, at least for now. such good advice. I have 3 kids at 3 diff schools and activities etc plus hubby is away for an extended period. Im am going to focus on my diet and be happy with my 4 days a week workouts. Wow! Sounds like you are doing an awesome job with so much on your plate.